Go! RideShare is a secure free on-line commuter matching service available to anyone who lives in Berrien, Cass or Van Buren Counties who is interested in sharing the ride to work. Commuters who register with Go! RideShare are sent an email once a match is found of people or co-workers who are going the same direction at approximately the same time of day. For more information about this service call 269-925-1137 x 1521, email kmartin@swmpc.org or fill out our online registration form. Please note that GO! RideShare does not sell, share, or trade the information you provide. Ridesharing can help those with cars spend a lot less, while helping those without a car get around. Splitting costs with just one other person is like paying half price for your gas-and the more people you add, the more you save. Carpooling interview on 98.3 FM. Carpooling interview on 103.7 FM. Who shares rides? Friends and family often share rides, but many people are looking to share more rides more often in order to save money, help others get around, and/or reduce pollution. The Rideshare program helps people find rides and drivers find passengers. It's not all-or-nothing! 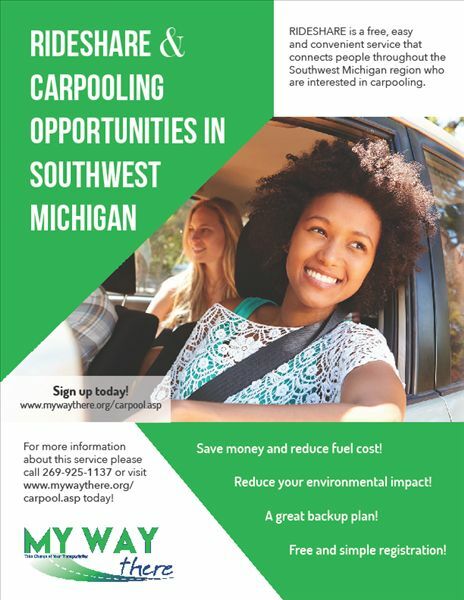 You don't have to share rides all the time or carpool every day to try out the benefits of carpooling. Sharing the ride can be great for trips to the grocery store, helping get kids to school or around town, social events, or a weekend getaway to another city. Consider sharing a ride with one or more people you don't usually ride with, one time. Or try carpooling to work one time, or one day a week. Local Rideshare Offices (LRO) help commuters find vacancies in existing vanpools, or match people who are interested in forming a new carpool or vanpool group.